RegistryShare is WedShare.com's exclusive cash wedding registry service. You can create monetary gift lists and include them on your Online Gift Registry page (i.e. contributions to honeymoon, tuition, home down-payment, etc). Allow guests to contribute to your monetary gift lists via a PayPal account, or by cash/check. Creating a new item. You can upload imagery for each item, too. Set up categories and organize your monetary registry into cash items or even a full-blown honeymoon itinerary as a honeymoon registry, where guests can purchase romantic dinners for you two lovebirds, or contribute to your airfare. The sky is truly the limit, and you can create as many monetary gift registries as you like. Create items for your guests to contribute towards. How do guests pay for the items you set up? We've integrated RegistryShare with PayPal, one of the most widely used and accepted online purchasing services in the world. Your guests will be able to contribute to your future happiness with any major credit card in a secure, insured payment environment. As soon as they pay, you have access to the funds and can deposit them electronically to your bank account. And PayPal accounts are absolutely free to set up. 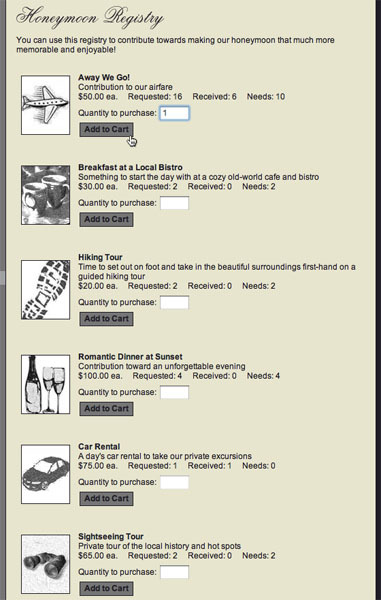 You can also configure your monetary gift lists to allow guests to send in cash or check payments. For the most flexibility, set your registry to allow both PayPal and cash gifts. Set up your monetary registry today, and start receiving cash gifts while providing your guests with unparalleled convenience in contributing towards your future. * While WedShare does not charge any fees for your Cash Registries, a small processing fee may be required by PayPal.com for some transactions processed through their service. Please see their website for more details and their current fee schedule.